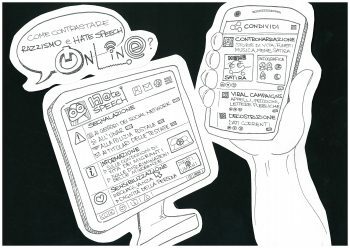 in particular through social networks: this phenomenon is difficult to control due to the nature of the medium in which it develops. All available sources, both official and unofficial, document a worrying growth of racist discourses in Italy and in Europe. The inversion of this trend requires a specific, transversal and coordinated commitment of all the subjects involved: the victims and their representative organizations, the anti-racist organizations, the traditional and online media system and the national and local institutions. Lunaria has long been engaged in the fight against all forms of discrimination and racism and in recent years has devoted specific attention to the analysis of stigmatizing, intolerant and aggressive discourses that choose as special target migrants, refugees, Roma and more in general citizens of foreign origin residing in Italy and in Europe. The project Re-YOU-REU is part of this strategy. RE-YOU-REU is a project supported by the Erasmus + program that aims to develop a structured dialogue between young people and local institutions in Rome, Barcelona and Thessaloniki to better prevent and combat racism and the spread of hate speech to local, national and European level. RE-YOU-REU is promoted by Lunaria in collaboration with GES (Gabinet d’estudis socials) of Barcelona and Antigone Center for information and documentation on racism of Thessaloniki. 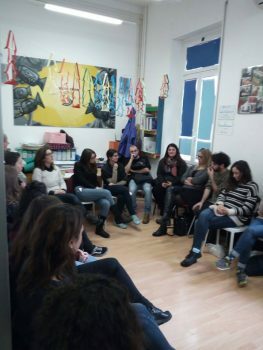 Started in September 2018, the project includes the organization of 1 national workshop in Italy (LINK, In Italian), the consultation of young people on racism and on the best ways to combat it, the holding of an international meeting in Rome on January 2019 and the promotion of a communication campaign to raise awareness on human rights and against racism in view of the European elections of 2019. The consultation has been articulated in two actions, the interviews and the online survey. 30 face to face interviews have been carried out to 30 young people between the ages of 18 and 30 who are not active in youth organizations and are identified in significant open spaces of socialization in each city. The goal of the interviews was to investigate the perceptions of the phenomenon of racism by young people chosen randomly and not active in youth organizations or in defense of human rights. – to investigate the current perception of the phenomenon of racism (definition, direct experience, main elements of the self and representation of his own subjectivity, identification of the main causes, identification of the most responsible subjects) by young people active in youth organisations. – to investigate what policies/actions/initiatives are considered to be more effective in combating the spread of racism among young people, whether they are promoted by civil society institutions or organisations. – to gather the opinions of youth about the most effective communication channels and tools to prevent and combat the spread of racism in the youth world.